Lake Forest RV Resort is an excellent destination for RVers to enjoy lakeside activities, golfing, and the outdoors among 100 wooded acres. Situated on the picturesque Great East Lake, with crystal clear waters, the area is perfect for enjoying outdoor activities such as canoeing, kayaking, sailing, fishing, swimming, and viewing wildlife. The lake covers an area of 3 square miles, with the village of East Wakefield located nearby. The resort offers 130 spacious RV sites, that include full hookups (water, electricity, sewer), with the option of having phone service. The resort also has a laundromat. At the clubhouse, with meeting room, fireplace, and large kitchen, there are many planned activities and social events to keep guests busy and entertained. After a morning of hiking around the lake, take in a round of golf at the resorts' own golf course. Located near RV sites on well manicured grounds, there are also several more courses to enjoy nearby. The resort hosts many rallies and outdoor events yearly, including a Fourth of July Barbeque, a Golf Tournament, Lobster Bake, and Grandchildren's Weekend, all held in August. A large field is also available, with electricity and water nearby for up to 40 RVs to hookup. Lake Forest RV Resort is open seasonally, from May 9th to October 15th. To make a reservation, contact them at 603-522-3306 or via email here. 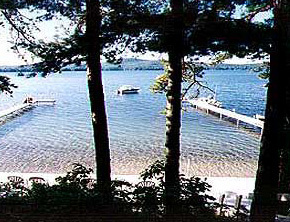 Lake Forest RV Resort is located on Dearborn Road in East Wakefield, New Hampshire. Just one hour north of Portsmouth on the Spaulding Turnpike (which is Route 16), when you are one and 1/2 miles past Route 109, turn right (on other side of Palmer's Motel), towards Wakefield. Then, turn left on Route 153 for 2 miles, and turn right on Acton Ridge Road for 1 1/2 miles until you get to Dearborn Road. Turn right on Dearborn Road to the resort gate. If you do not already have a gate code to get in, keep going to the end of Dearborn Road, and turn right to enter our resort.